There are numerous raft manufacturers out there. These are the boats we recommend. If you are investing in a big ticket item such as a raft, or even an inflatable kayak, it is important to know that it is well-made and durable. The manufacturers listed below cover a variety of price ranges. 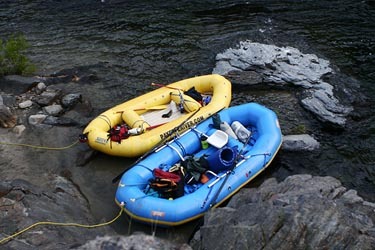 Keep in mind that most rafts designated as “outfitter” series are going to be the most durable since they are designed to be used day after day after day. However, if you are floating on the Yama River once a year, or doing a few day trips on your local Class III run, you might not need something so hefty. Also, the decision between plastic (PVC) and Hypalon rubber or neoprene rafts is that plastic boats tend to be stiffer because they can withstand more air pressure. They also slide over rocks better when wet. Hypalon, however, is extremely durable and can be dragged around and take “abuse” much better. AIRE – Made in Idaho, these PVC rafts are popular with private boaters and some commercial outfitters. They have an amazing 10 year warranty that covers the boat no matter who the owner is. Alpacka Rafts – Extremely lightweight, packpable, wilderness rafts. Made for 1-2 people and usually weighing under 5 pounds. These are perfect for rafters looking to run remote stretches of river, but they are perfectly fun on a local, easily accessible run. AVON Inflatables – Extremely durable handmade rafts made of Hypalon. More on the pricey end of things, but well worth the money if you plan to use your raft often. Clavey River Equipment – Sells AVONS and a whole bunch of other equipment. Hyside – Reliable rafts made of Hypalon rubber. Maravia – In business for 35 years, these PVC plastic boats are manufactured in Boise, Idaho and are made to last a lifetime. NRS – Affordable, rafts made by a well-respected company. Great for private raft use. Made of urethane and Hypalon. NRS is also a dealer for most of the other raft manufacturers. Sotar – Made in Oregon, out of Urethane coated nylon which can be inflated to very high pressures. They are one of the stiffest boats available. Affordable, lightweight, well-performing rafts. Vanguard – Popular amongst outfitters as well as private boaters. Wing – They don’t make a whitewater series anymore, but if you can find a used one, they are great boats.